Last night, the House of Representatives and the Senate Armed Services Committee made a historic vote against Don’t Ask Don’t Tell. By a count of 234-194-10 and 16-12 respectively, both legislative bodies added an amendment to the Defense Authorization Bill that would set up a structure to end DADT. In the House, the rhetoric was thick. Here, for your edification, is an only slightly biased Point/Counterpoint from the floor. Point: By Representatives Louie Gohmert (R-TX), Mike Pence (R-IN), Todd Akin (R-MO), Trent Franks (R-AZ), and Buck McKeon (R-CA). Counterpoint: By House Majority Leader Steny Hoyer (D-MD). To be clear: The House did not vote to repeal DADT tonight. Neither did the SASC. In both cases they voted to add an amendment to the Defense Authorization bill that creates a structure for possible, potential, if-a-bunch-of-other-conditions-are-met repeal of DADT. Even if we get over all those hurdles and tick all those boxes, even if/when DADT is repealed, lesbian and gay soldiers will not be permitted to serve openly in the military. Rather, we’ll return to 1993’s status quo where military policy will not permit lesbians and gay men to serve openly. There is hope–I think quite reasonable hope–that President Obama will take care of that as soon as Congress’s procedure is completed, but we need to stay on message. This fight won’t be won until LGB people are permitted to serve with honesty and integrity, just as their straight counterparts are required to do. In other words, it’s not Woo-Hoo time. 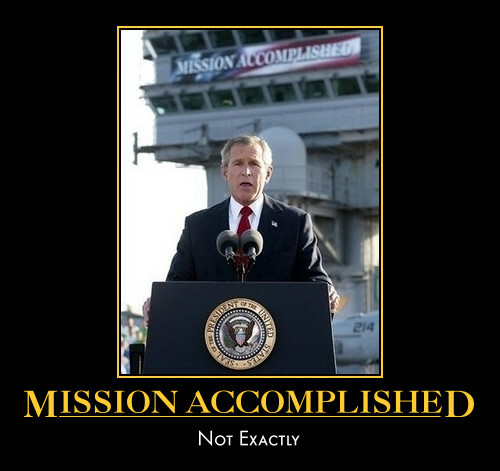 Cork the champagne, put away the noise makers, and tear down the “Mission Accomplished” banner. We have at least 8-12 months of actively fighting Republican attempts to keep discrimination alive (including a vote by the full Senate in June) before we can declare victory. On yesterday’s edition of ABC’s World News Tonight, Bob Woodruff hosted a segment about Jeff Sheng‘s Don’t Ask Don’t Tell art exhibit/ photobook. He recently took portraits of currently serving lesbian and gay servicemembers whose lives have been changed by DADT, with their identities obscured and faces hidden. Sgt. Anthony Bustos, one subject of the photobook entitled “Don’t Ask Don’t Tell, Volume I”, took the opportunity to come out of the closet. With six months left in his enlistment, the Army medic (previously known as “Matt” of Lubbock, Texas) wanted to explain why he would not be reenlisting. Sgt. Bustos’ coming out (congratulations!) comes in an important week for DADT repeal. This is a loooooong post, but we have a lot of important ground to cover. Stay with me! On Monday morning, someone at the White House noticed that DADT repeal was going to be pushed whether they liked it or not, and got to work crafting what is, as Jeremy Hooper at Good As You points out, best described as a compromise of a compromise. Compromise #1: The LGBT community wants repeal and open service now, and the White House offered a year-long study on implementation with the possibility of open service voted on next year. Compromise #2: Congress (after a little prodding) wants a vote in 2010, so now the White House is giving support to a vote this week with implementation after several conditions are met at a later, unspecified date. The implementation study already underway must be completed and turned in to Defense Secretary. The President, the Secretary of Defense, and the Chairman of the Joint Chiefs of Staff must tell Congress that the Defense Department has prepared regulations for implementation. They must also assure Congress that the Military-Industrial Complex won’t go blooey if lesbian and gay soldiers are allowed to talk about their spouses and kids. At that point, DADT will officially be repealed. BUT. The amendment does not include a provision requiring the government to allow lesbian and gay soldiers to serve openly. Rather, by only striking DADT, the policy will simply be moved from the legislative branch back to the executive branch, where it was until DADT was passed in 1993. Next the commanders of the military will presumably implement a regulation permitting lesbians and gays to serve openly. Given how deeply anti-gay animus continues to be with older commissioned officers, that’s not a presumption I’m terribly comfortable making. The best-case scenerio, of course, is that once the ball is squarely in his court, President Obama will issue an Executive Order requiring the military to allow lesbian and gay soldiers to serve openly using the regulations that were prepared in Step 2. This would to a certain extent mirror President Truman’s order to integrate African Americans into the military with 1948’s Executive Order 9981. I just hope the President has enough foresight to go a step further than Truman and include a deadline. We don’t want it to take another military disaster to force integration. Remember, it’s important that the amendment be placed by the Senate Armed Services Committee before the Defense Authorization Bill goes to the full Senate. This lowers the bar considerably, since it would then take 60 votes (assuming filibuster) to remove DADT repeal, a threshold that the Senate would be much less likely to meet. The committee vote and the full Senate vote are expected this week. Word from the House of Representatives is that they indeed have the votes to pass repeal as early as next week. But before we break out the champagne and celebrate a major victory, it’s important to remember that this compromise, if passed, is only a first step. 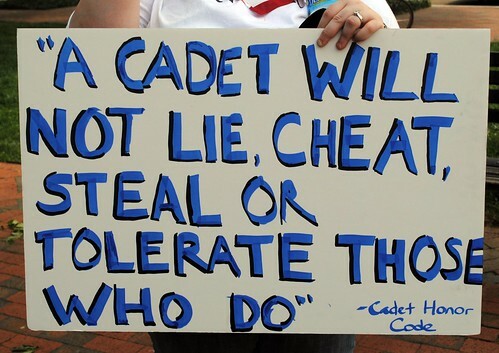 We aren’t there yet, and as Lt. Choi said in a video released by GetEqual last night, we can’t celebrate until and unless lesbian and gay servicemembers can serve openly without fear of losing their jobs. As so many have said, the best chance for DADT repeal is inclusion in the Defense bill. No action this year would mean that DADT probably wouldn’t be repealed for another generation, and this compromise would remove that concern, or at least decrease it. Let’s face it, a watered down and incomplete version of an earlier watered down and incomplete version with several strings attached and no deadline may be the best we can get. This right here is why I hate politics. I will say this, though. If this compromise passes and President Obama kicks it down the road again, there won’t be enough jails to house all the homos lined up on the White House fence. And yes, I’m volunteering to be the first. By now you’ve probably heard of the couple in the southeastern African country of Malawi sentenced last week to 14 years in prison with hard labor, the maximum sentence, for “unnatural acts and gross indecency.” Tiwonge Chimbalanga and Steven Monjeza were symbolically wed December 28, 2009 and were arrested shortly thereafter. Chimbalanga has been ill for much of the time that the two have been incarcerated (separately), but has so far been refused medical treatment. Neither is expected to survive prison. Many western nations, including the United States and England, have officially condemned the conviction, and Amnesty International has called for the couple’s release. As far as I have heard, no one expects that to happen. Steven Monjeza and Tiwonge Chimbalanga arrested earlier this year. After reading of this monstrous blight on the history of the humankind, I wondered what response the National Organization for Marriage, the ranking anti-marriage group in the United States, would have. Though NOM doesn’t seem to have officially responded to the Malawi conviction, a link to the story did appear on the group’s Facebook page. Marcela Lazarte Rodriguez: I just found this in MSN and I thinkis (sic) great what the judge did in Malawi. Zero tolearnce (sic) to this behavior is perfect. Shelah Bumgarner Wik: I commend the judge for his strength ! God please protect him and others in this country,who are trying to enforce Gods laws. Michael Thorpe: Malawi sounds like a good place to move to. I hasten to reiterate that this is not an official NOM stance. I would point out, however, that the NOM group’s administrator regularly deletes comments that disagree with NOM’s general principles, including some comments in the quoted thread. Also, remember that NOM has, according to him, given the page’s administrator the responsibility of promoting NOM’s point of view online. I don’t know what NOM’s leaders think of imprisoning gay people. But thanks to this exchange in a NOM-operated forum, I have a pretty good idea what their supporters think. Last night, Rachel Maddow interviewed Rand Paul, the newly chosen Republican Senatorial candidate in the state of Kentucky. Throughout the 19-minute interview, Paul adamantly used every subject-changing trick in the book to keep from saying what he really thinks about legal discrimination. Specifically, he was desperate not to admit on camera that he would have voted against the Civil Rights Act of 1964 because it made discrimination by businesses (restaurants, bus companies, etc.) illegal. It’s shockingly outdated thinking, right? Totally reprehensible, with no stipulations or exemptions. Hopefully this interview will help keep Paul from being elected, but how would Americans react if he said that the same type of discrimination by the same type of business is okay if the victims are gay? Unfortunately, we found out the answer to that question last night too, on ABC’s What Would You Do? The hidden camera show hosted by John QuiÃ±ones spent an eye-opening segment finding out what would happen if a waiter verbally abused a gay family (in front of their young children, no less) and refused to serve them. Understand, every bit of what you just watched is 100% legal in 29 states. And I find it striking that the majority of the people who spoke up were members of a minority group. That should tell us something about the discrimination. There is no current movement to add LGBT protections to the Civil Rights Act to stop this kind of abhorrent, state-sanctioned discrimination. Last November, Puerto Ricans and the LGBT community at large were horrified when the body of 19-year-old Jorge Steven LÃ³pez Mercado was found burned, beheaded, and dismembered on the side of a road near his home. The killer, Juan Antonio MartÃ­nez Matos, was arrested five days later and quickly enhanced his confession with a Trans Panic Defense. Last week, exactly six months after brutally murdering Steven, MartÃ­nez unexpectedly pleaded guilty in a court hearing just days before his trial was to begin. Edge‘s Michael Lavers filed this report. Juan JosÃ© MartÃ­nez Matos, who had been scheduled to go on trial for Jorge Steven LÃ³pez Mercadoâ€™s death on Monday, May 17, confessed to the crime during a hearing in Caguas on Wednesday, May 12. MartÃ­nez told the court he understood the consequences of his actions, and Judge Miriam Camila Jusino immediately sentenced him to 99 years in prison. Primera Hora reported LÃ³pezâ€™s parents, Myriam Mercado and Jorge LÃ³pez, hugged prosecutor Yaritza Carrasquillo after the hearing. Mercado told the newspaper, however, MartÃ­nezâ€™s confession was bittersweet for her and her family. Jorge LÃ³pez evoked his faith. Pedro Julio Serrano of the National Lesbian & Gay Task Force, who was in Caguas when MartÃ­nez confessed to LÃ³pezâ€™s murder, told EDGE there was not a dry eye in the courtroom. He added LÃ³pezâ€™s family remains a source of inspiration for him and other LGBT Puerto Ricans. “The family is sending a powerful message to the world of the love that conquers hate,” said Serrano. He further stressed his work on behalf of LGBT Puerto Ricans will continue. Please continue to keep Steven’s family and friends in your thoughts and prayers. This may have put a merciful end to the court case against his killer, but they will continue to feel his loss for years to come. The clips come from Debra Chasnoff’s award winning 1996 documentary It’s Elementary: Talking About Gay Issues in School, which appeared on public television stations in 1999. Click here for more clips from the film’s official home. Based on these clips, I can’t wait to see the rest of the film. It looks like a fantastic study of how critical thinking, social skills, and tolerance should be taught. I understand why Louis is all in a tizzy (they aren’t teaching the kids to shame gay people, after all), but it’s so bizarre when you compare his commentary on youtube and facebook to what’s actually happening in the clips. I explained to them why, as a straight man, I would be interested. And I like to answer the question because I think that it pushes them to think of this as more than just a lesbian and gay matter. That’s how their life is! They’re gay, so what? That’s how their life is; I don’t think people should be strict about them, ’cause if they were gay they wouldn’t want to be getting beat up. …or stuff… Can I go to the bathroom? A lesbian mom said, “You may lose your job over this. Do you want to go forward?” … I’m not a flagbearer, but I felt strongly that the children in this community needed to be educated around this topic. In addition, Marinelli claimed to be working “directly” with NOM on his group’s twitter account in March 2010. Also, he is facebook friend to both current NOM President Brian Brown and former President Maggie Gallagher according to his facebook page, and Brown is a member of his NOM page, which is different than the group’s original page listed on NOM’s blog.